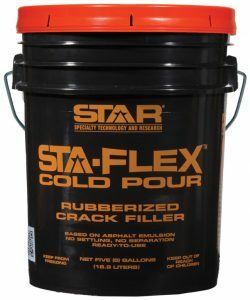 A rubberized cold pour crack sealant that works great and stays flexible. COLD POUR APPLICATION – does not need heating before application, It is based on asphalt emulsion. TOUGH FLEXIBLE & DURABLE – STAR STA-FLEX is RUBBERIZED using high-molecular weight polymers. READY-TO-USE – Apply direct from container. No mixing is required. EASY TO APPLY & CLEAN UP – Clean up with water. SAFETY – No burns or hazardous fumes. A rubberized asphalt emulsion patching compound. Tough, Flexible and Durable, it is rubberized with polymers and reinforced with specialty chemicals and minerals. Cold-Pour and Ready to us. 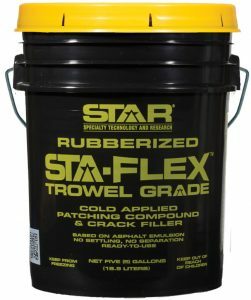 Being asphalt emulsion based, STAR SURE-FLEX does not require and pre-heating and is ready to use straight from the container without extensive mixing. Compatible with both coal tar and asphalt emulsion based sealers. Safe to apply and water clean up. Will not burn. Tools can be easily cleaned with water. Cold-Pour and Ready to use. 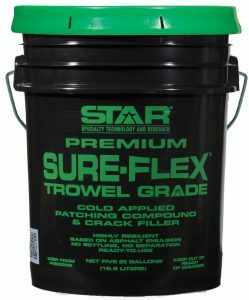 Being asphalt emulsion based, STAR TROWEL GRADE CRACK FILLER does not require and pre-heating and is ready to use straight from the container without extensive mixing. Star ELASTO-BOND HS is a premium quality direct fire material that is extremely successful in driveway and parking lot applications. It is chemically formulated to withstand temperatures up to 450ºF without experiencing degradation. 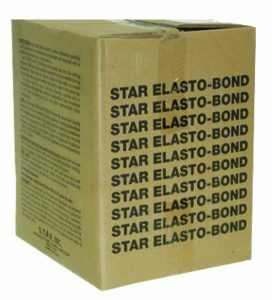 Star ELASTO-BOND is the standard in parking lot crack sealants. It is designed for use in oil-jacketed kettles or direct-fire kettles providing that it is equipped with a mechanical agitator system and temperature controls. Star ELASTO-BOND XT 10 is ideal for the contractor who wants a single product to use in both road and parking lot applications. It has a high softening point & great low temperature flexibility. It meets ASTM D 6690 Type 1. Star ELASTO-BOND XT 10 has a lower penetration can be used in parking lot applications. Star ELASTO-BOND XT 10 does not contain any recycled rubber, it can be used in oil jacketed & direct fired kettles with mechanical agitation. FLEX-A-FILL is a hot-applied polymer modified asphalt product used to fill cracks in asphalt concrete or Portland cement concrete pavements in moderate climates. FLEX-A-FILL is supplied in solid form which when melted and properly applied forms an adhesive and flexible compound that resists cracking in the winter and is highly resistant to tracking or pick-up by vehicle tires at warm summer temperatures. FLEX-A-FILL is used in highway, street, airfield and parking lot pavements and is applied to pavement cracks using either pressure feed melter applicators or pour pots. FLEX-A-FILL is highly recommended for sealing cracks in asphalt pavement prior to coal tar sealing, slurry, overlay, or chip sealing. At application temperature, FLEX-A-FILL is a low viscosity, self-leveling product which easily penetrates narrow cracks. FLEX-A-FILL has a fast melt time and can be melted in jacketed double boiler type melting units, or in small direct bottom fired melters. Both melter types must have sufficient agitation and temperature indicating devices to assure the material is heated to and maintained within the specified application temperature range of 350° to 400°F (177 to 204°C). VOC = 0 g/l.